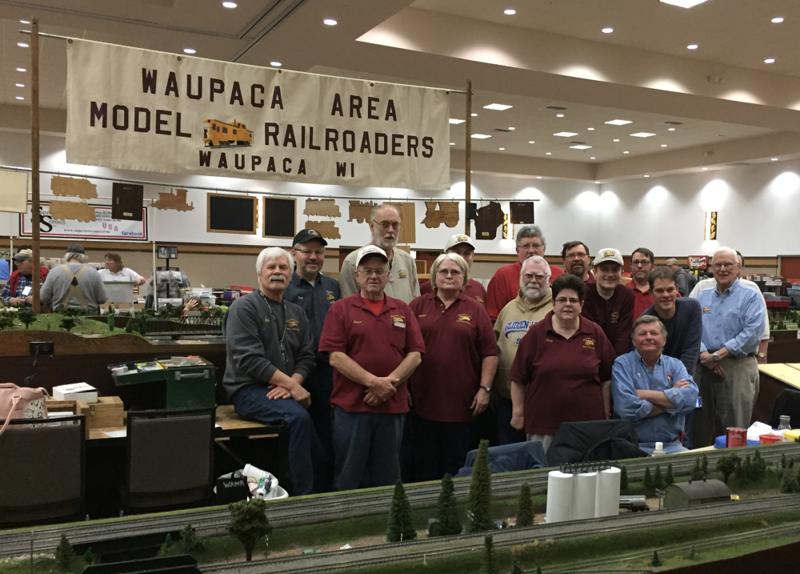 The Waupaca Area Model Railroaders started in 1964 when three area railroad buffs began meeting to construct an HO scale layout. To accomodate this major undertaking one of the founding members, vacated a storage room (12' x 24') in the rear of his garage. A furnace was added to allow work on the layout to continue throughout the cold Wisconsin winters. These dedicated modelers worked three nights every week. By the mid 1970's growing pains hampered further expansion, and in 1975 a new 20' x 36' building was constructed adjacent to the garage location and the monumental task of moving was undertaken. The layout was designed as three separate railroads and remained separate for a few years. On the lower level,the Lind Center & Southern was built first and was closely followed by the Soo Line. The Kirkton, Tombstone and Walla Walla was constructed as a branch line on the upper level. At a meeting of the "Board of Directors" it was decided to merge the Soo Line and the LC&S into one major road, combinining all operations and electrical controls. With the merging of the railroads, the group also combined the two individual control panels into an elevated control tower in 1985. This was a major operating improvement. This innovation allows the dispatcher to direct up to six engineers at one time. As membership grew, so did the group's activities and achievements. A unique addition was the purchase of a Duluth, Massabe and Iron Range caboose and an operating cross-buck. These additions were the result of a trip to the Soo Line Historical and Technical Society convention in Duluth in 1984. Two of these cabooses, numbers C44 and C36, were brought for $1,500 each from the Duluth Museum of Transportation. Number C36 was later sold to the Iola Historical Society and moved to a track beside the old Iola and Northern depot in Iola, Wisconsin. Scrap rail and ties were purchased from the Soo Line in Stevens Point and collected from the Waupaca area. The track was laid next to the club's meeting building and on February 26, 1985, using trucks and a 50 ton crane from local contractors, the caboose was moved to its present location. The club newsletter, "Chatter from the Crummy", began as the occasional voice of the club in 1986. From its beginnings as a four page reporter of club happenings, it has grown into a quarterly publication of ten pages complete with pictures and product reviews. "Chatter from the Crummy" began an awards program in 1990. The Cliff Deveraux Award for railroad modeling (named in honor of one of our founding members), and the Editor's award for contributions to the club and the model railroading hobby. The club has hosted four Winnebagoland Division of the NMRA meets. The first was November 1982 held at the Oakwood Supper Club. The second was held on October 10, 1987 at the Waupaca High School. The third was held on October 15, 1992 at the Henrickson Center, and the fourth was held in 2001 at the Henrickson Center. After the second meet, in 1987, the club embarked on a project on building a portable layout to be displayed at the train shows. The original size (8' X 28') was designed on a thematic approach to depict a 45 mile section of the Soo Line (now the Wisconsin Central) from Waupaca to Junction City, Wisconsin. After a modest start the layout has grown to 22' X 52' with over --- feet of track. Several additions and rebuilding have continuously updated the scenery and track design. Scenes added include an engine facility at Stevens Point and dioramas depicting an Amish Farm, the 1988 wreck at Sheridan, and typical sandstone rock out croppings representative of formations found along the right of way. The sidings at Waupaca and freight yard at Stevens Point allows the club to run two trains in opposite directions, in spite of being a single track system. In 2000, the club installed the Digitrax Digital Command Control System, which allow independent locomove control that allowed multiple trains to run on the layout in either direction at the same time, which allowed better operating flexability. In 1989, a Nomad 14' camping trailer was purchased to transport the layout. After removing the "comforts of camping", the trailer was fitted with slide rails to store and transport the layout to the various meets and shows thoughtout Central Wisconsin and as far away as LaCrosse and Milwaukee. In 1994, a used 26' former racecar transport was purchased and in 2001 a new trailer was purchased to transport the layout. 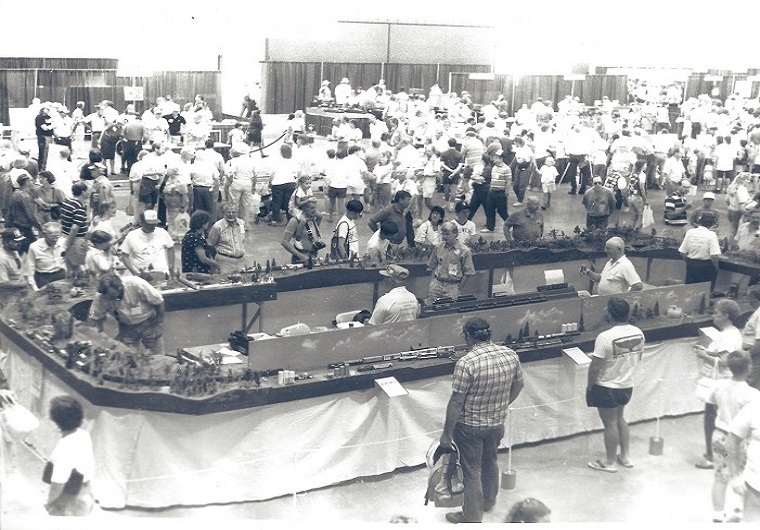 In June 1991, the club will caravan to Denver, Colorado to display the layout at the National Model Railroad Association Annual Convention, and in 1997 the layout was displayed at the National Convention in Madison. In June 1989, we were incorporated as a non-profit educational organization with the official title of "The Waupaca Area Model Railroaders LTD". Twenty members strong by 1989, found the club again outgrowing its facilities. During the summer and fall of that year. a 14' x 20' meeting room was added including a ticket window, work benches, book cases, shelving for storage an display, and a freight yard that connects to the layout in the original part of the building. A Lionel shelf layout was begun in 1990. This layout running around the edges of the club's new meeting room includes a double track mainline, sidings and operating accessories. In June 1990, the club sponsered it's first Strawberry Festival Train Show held in conjunction with the Waupaca Area Chamber of Commerce Strawberry Festival. As one of the only model railroad shows held in the summer (annually in June), it has drawn interest of railroaders from throughout the state. This, along with working at the Iola Car Show, is the club's money maker to raise funds for club projects. This show is a showcase for the club and draws model railroaders and the general public to the Waupaca area. The WAMR Open, our annual golf outing and only non-railroading function sponsered by Gordy and Diane Sauve, was started in June of 1990 and has become an annual summer event for all club members and their families. In the 1990's, the club began round-robin meetings for it's Thursday night meetings. Each Thursday night, members travel to different members's homes to work on his layout. 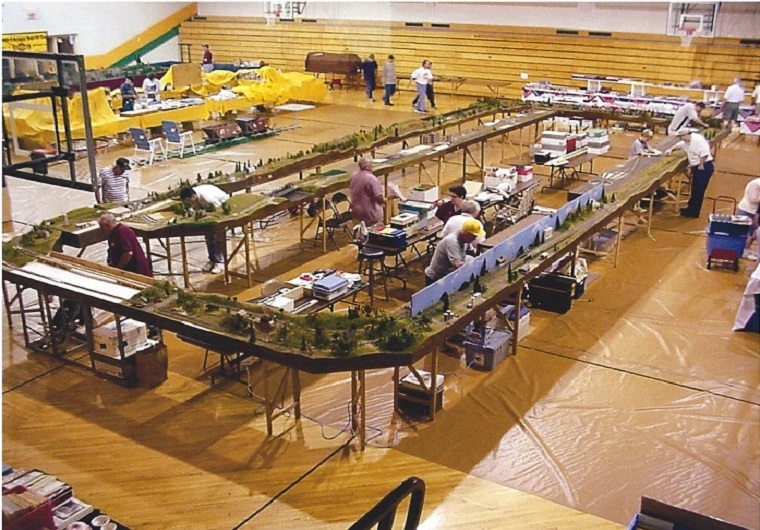 This has proven to be an extremely worthwhile meeting format as all members have benefitted by having their layouts worked on by the members, each with his own expertise and also the individual members sharpen their modeling skills by working with other members who may be more experienced on a particular skill area. One meeting of each month is set aside for an operating session held at one of the fine layouts completed enough for such a session. The club continues it's public service projects for the Waupaca area by sponsering a scholarship fund for a student graduating from Waupaca High School, and continuing their education at a college or tech school. Tuesday, January 29, 2019, Pat Lyons and Gary Oudenhoven were on the Scott Krueger morning talk show promoting the Artic Run train show. It was broadcast on the True Oldies Channel as WPCN 92.1FM and 1010 AM out of the Muzzy radio station in north Stevens Point. They were on the radio over 15 minutes talking about our hobby. Arctic Run 2019 Group Photo.